What do you get when you combine all the smash hit music of two great American classic rock artists BOSTON and STYX into one power-packed show? The answer is BOSTYX, a completely unique act that performs the feel-good, highly-polished hit music which dominated radio in the 70s and 80s. 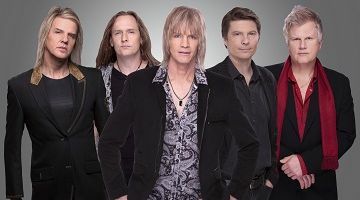 BOSTYX performs all the best-loved hits including “More Than a Feeling”, “Come Sail Away”, “Lady” and “Foreplay / Long Time” and also delves into deeper album cuts like STYX’s “Crystal Ball” and BOSTON’s “A Man I’ll Never Be”, a fan-favorite song that BOSTON has not performed live since the 1980s. BOSTYX features a spectacular lineup of LA’s finest professional musicians. BOSTYX features lead vocalist and guitarist David Victor. Drummer Glenn Jost is a monster behind the kit, while also deftly handling the operatic vocal stylings of STYX’s Dennis DeYoung. Bluesy blazer Roby Duron performs the most intricate lead guitar work of the ensemble with style and showmanship. Manny Aguirre handles the very complex bass lines of BOSTON and STYX with startling dexterity, while keyboardist Victor Bender performs all the incredibly complex arrangements, including the blistering “Foreplay” with ease. BOSTYX is a band that performs this epic hit music with care and enthusiasm.